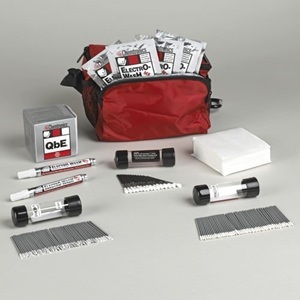 The Transportable Fiber Optic Construction Kit is perfect for crews performing fusion splice operations, who need to easily ship kits to remote locations. Chemtronics® has included all the cleaning supplies necessary for 2.5 mm end-face cleaning and successful fusion splicing in this convenient kit. Electro-Wash® MX Precision Fiber Optic Cleaner Pen and QbE® Cleaning System are included for performing the Combination Cleaning process. Swabs and wipes are included for cleaning the fusion splicer and work area. Swabs are also included for cleaning ferrules, alignment sleeves and backplane connections. Electro-Wash® MX Premoistened Wipes are included for tool and cable wiping.